There is a Post here but the answer doesn't fit because everyone knows the Social Login Logos. Four Buttons with Platform Name and the Logo. As long as they're obviously for use for logging in, then this is almost exclusively an aesthetic decision. Ultimately it's unlikely that a user that doesn't recognise the logo will attempt to use it to log in, and those that do will know what platform it is. The only answer is to do some user testing (great cadidate for A/B testing). Just having icons can be confusing, people might mistake it as links to the product/company social media pages (commonly found on most website headers/footers). You don't want users to be guessing, and so 'Login with ...' is certainly more useful and obvious. User testing is a good way to validate your designs and concerns, but sometimes it saves time to go with common/usual design practices and focus your energy on more important UX issues. Not the answer you're looking for? Browse other questions tagged website-design login or ask your own question. 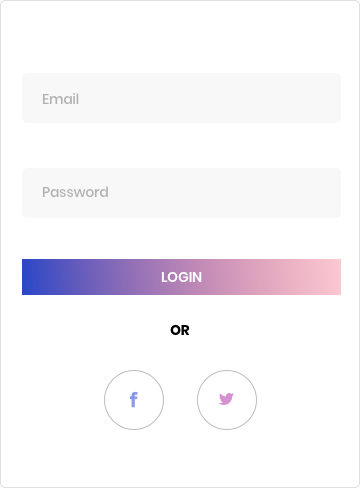 Can I combine login and signup with a single button?